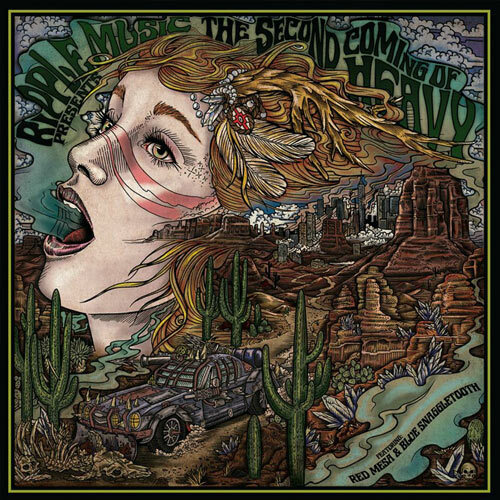 This Friday, December 9, 2016 will see the release of the latest installment of one of hard rock’s best ongoing series, the Ripple Music-offered “The Second Coming Of Heavy – Chapter Four” featuring the bands Red Mesa and Blue Snaggletooth. Always managing to pair up some of the best rock and roll bands from the underground, from Chapter One‘s Geezer and Borracho, Chapter Two‘s Supervoid and Red Desert, and Chapter Three‘s BoneHawk and Kingnomad, Ripple quadruples down with the latest edition’s duo of acts. Red Mesa are Albuquerque, New Mexico’s embodiment of psyche-oriented, stoned out Desert Rock while Ann Arbor, Michigan’s Blue Snaggletooth deliver up some intensely metallic-tinged, fuzzened Psyche Rock. These genre-based attachments and audible attributions were never more legitimate than on this team up where Red Mesa‘s 4 songs and Blue Snaggletooth‘s three provide the very epitomes of all the things that fuel these bands and make them so great.